Comment: Different Cover but same ISBN/Book. Dust jacket shows some wear (has light wrinkles from Water exposure). 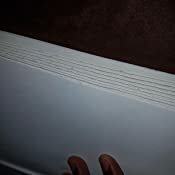 Front cover of Dust jacket has sticker residue (white fuzzy paper). Pages appear unmarked. Strong spine. 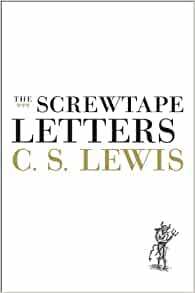 Start reading The Screwtape Letters on your Kindle in under a minute. I could not find my copy, and I wanted to read it again, and I bought a copy for my sister. If you like C. S. Lewis you will love this book. 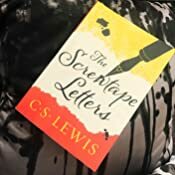 It.isn't difficult to read, (as I know he can be), rather, these are letters written from Screwtape, whom Mr Lewis refers to as the devil; to his nephew and pupil Wormwood. 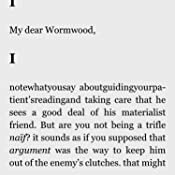 In these letters, Screwtape explains to Wormwood what he is doing wrong in trying to 'turn the patient' which is how Screwtape describes getting a Christian person to turn away from the Enemy, as he refers to God. Don't worry about reading about the devil, as I was concerned with when I started to read it. But the more you read it the better and closer relationship you can develop with God, which of course is what Mr. Lewis has intended. The author is pure genius. I have read Mere Christianity, The problem with pain amd A Grief Observed. I have also read his space trilogy Out of the Silent Planet, Perelandra and That Hideous Strength; which are all wonderful. Word of warning, A Grief Observed is a difficilt, depressing book. DO NOT READ IT if you are grieving about anything or one. 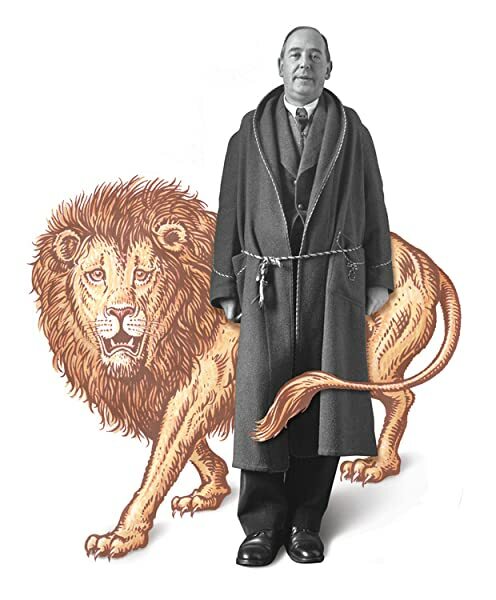 I hope this helps and helps people discover the genius, as I have, of C. S. Lewis. 5.0 out of 5 starsScrewtape to Wormwood: Here are some ways to mess with those fickle humans. Enjoy yourself. Some people are fascinated by the devil. I'm not particularly. Perhaps I should be, but I find it more helpful and rewarding for me on my spiritual journey to reflect on other Truths: the Trinitarian God, Christ, Grace, living an empowered Christian life. I do believe, however, as C.S.Lewis tries to make clear in this book, that Satan (the devil) exists. This is certainly part of Catholic teaching. See, for example, "Devil; Satan" in the Catechism of the Catholic Church. But also see "God," "Jesus Christ" and "Holy Spirit." This is where the focus is in Catholic teaching. But the Church doesn't neglect Satan. Unfortunately, I don't have a copy of the Summa Theologica with me now, or I'd check to see what Thomas Aquinas has to say on Satan. He is always, at least I find it so, informative. The point of the book is that Satan acts in subtle ways in human lives. Don't think he is likely to knock you over the head with a manifestation of his power and contrariness. He is much more subtle, and thus much more successful. And that is where the danger lies. If we are aware of and sensitive to spiritual things, we no doubt have seen this. At least that is my experience. When we read this book in our parish book club, it did not receive a raving review, although it received a solid one. (Some, being unfamiliar with this type of literature, found it a bit confusing.) I'd recommend it, as part of the Christian canon of books. And more. After all, it is not good to ignore what can destroy the life and love of God in us. 5.0 out of 5 starsA classic, and rightly so. Highly recommended. Sometimes I hold off on reviewing "classics" because everyone tells me how danged "classic" they are and I tend to not trust things that are "popular." So, the long wait (my whole life) before I finally read C. S. Lewis's <i>The Screwtape Letters</i> and the appended "Screwtape Proposes a Toast." Wow! It is good. It is, despite some dated references in a dated setting, still relevant to present-day mankind and their souls. The story is so well-known, and so easily findable on Wikipedia and the like, that I won't give any sort of recap. 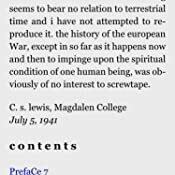 A million other reviewers have praised this work's virtues, so I will just say that Lewis's take on how and why mankind could be tempted to hellfire is brilliant. As I said, still relevant too. I will give a few examples of Lewis's prescient warnings and insights. In "Screwtape Proposes a Toast" he derides the educational system. How familiar does that sound? The dumbing down of our educational system? The rampant student loan debt because everybody MUST go to college! Or on the pitfalls of democracy. Democracy as in everyone is equal, which is how the demons want to define it. "..they [the humans] should never be allowed to give this word a clear and definable meaning." Why? Teach man that instead of all men being created equal, and how every man is equal before the law, the government, and God, no, falsely teach man that "all men <i>are</i> equal" (p. 122, emphasis in the original). Why? "As a result you can use the word <i>democracy</i> to sanction in his thought the most degrading (and also the least enjoyable) of all human feelings. You can get him to practise, not only without shame but with a positive glow of self-approval, conduct which, if undefended by the magic word, would be universally derided." (p. 122). Does that not sound like the decline of Western thought and values in a nutshell? "We are all equal! All the same! Democracy! So do what everyone else is doing!" Or, to give it a socialist tinge, which is what Lewis mainly meant I think. You would not steal another man's property as a burglar, but call it a tax to pull down the rich so all men are at the same level! Democracy! A classic, and rightly so. Highly recommended. Reviewed ISBN 0684831171. Two prefaces by the author included.